WITH only three more rounds of the home and away season to go, wins are like gold in the race for finals positions. 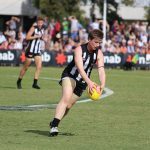 The Demons defeated the Lions with a thrilling one-goal victory on Friday, while the Giants reigned victorious against the Dockers on the road. 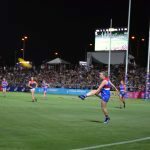 On Saturday night, the Crows dominated the struggling Blues, and in Moe, the Bulldogs continued their red-hot form with a win against the Pies. The Demons have upped their finals chances with a win against premiership favourites, Brisbane. As the final siren sounded, the Lions players pleaded with the umpire for a tentative free kick, but it was to little avail, going down by six points at Casey Fields. Melbourne captain, Daisy Pearce was back to her best after an off week, kicking the opening two goals and racking up 24 disposals. On-ball guns Karen Paxman (25 disposals) and Elise O’Dea (23 disposals, 12 tackles) also played a big part in the win. Meanwhile, a valiant effort by Kate Lutkins (26 disposals) in defence kept Brisbane in the hunt for victory. The Lions almost fought their way back into the game, thanks to Sabrina Frederick-Traub’s three goals, but in the end they just fell short. A commendable performance by the Brisbane defence, lead by Kaitlyn Ashmore (16 disposals), held Melbourne to a total of 4.10 and a conversion rate of just 29 per cent. An assertive 18-point win on the road keeps the Giants’ finals hopes alive in 2018. Six different goal scorers and a dominant ruck performance by Erin Mckinnon (39 hitouts) were key elements to the victory. Despite the Dockers winning the clearances 28-15, they were unable to capitalise when it came to attacking, and struggled inside 50. The Dockers only took one mark in their attacking half of the ground, while GWS took six. Courtney Gum was often responsible for kicking the ball onto a teammate’s chest, and got plenty of the footy herself, gathering 16 disposals. Gum also laid eight tackles, highlighting that her defensive work is just as good as her offensive work. For Fremantle, it was captain Kara Donnellan who stood up once again for her side, laying 10 impressive tackles to keep the Dockers in the hunt. 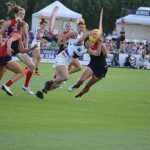 Despite losing AFLW MVP, Erin Phillips to injury in the second quarter, the 2017 premiers put on a dominant display with a 35-point win against Carlton. The Crows outplayed their opponents in almost every aspect, with their on-ballers doubling Carlton’s clearances (30-15). Chelsea Randall lead from the front once again for Adelaide, dominating in all areas of the ground. Randall was able to rack up 15 disposals and seven tackles to complete another all-round performance this season. Partner-in-crime, Ebony Marinoff also had another impressive performance, gathering 16 disposals, and laying six tackles. 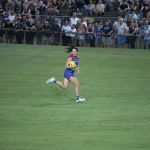 It may not be a 21-tackle performance, but Marinoff proved that she could apply pressure in many different ways besides tackling, intimidating the Carlton midfielders with her strength and speed. For the Blues, it was up to Katie Loynes to get her side back on track after Adelaide kicked away. Loynes stood up when nobody else could, laying 10 tackles and putting her body on the line numerous times throughout the game. The Bulldogs have consolidated their spot on top of the ladder with a win against the Pies. 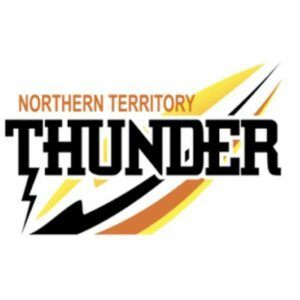 With only two rounds to go, a finals berth seems almost in the books for daughters of the west. Collingwood dominated in the ruck contest (43-16), thanks to another great performance from Emma King, but that did not worry the Dogs. Their star midfielders were able to read the taps, and penetrate the ball into their forward half. 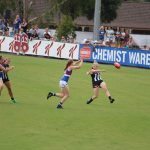 The likes of Ellie Blackburn, Emma Kearney and Kirsty Lamb combined to outplay the Pies in the middle of the ground, with 33 clearances to 13. This was the highest team clearance total of the round, showing how formidable the Dogs are in the midfield. Blackburn in particular continues to dominate, kicking a goal to go with her 17 disposals for the day. ROUND five was the round of high-possession games. The impressive Melbourne trio of Daisy Pearce, Karen Paxman and Elise O’Dea combined for 72 disposals, while Brisbane’s Kate Lutkins had her fair share of the ball with 26 possessions out of the backline. 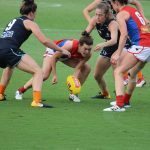 At Moe, Western Bulldogs star midfielder, Ellie Blackburn was able to gather 17 possessions in a best-on-ground performance, helping out Emma Kearney, who battled against Collingwood’s Brittany Bonnici during the match. Over in the west, GWS’ Courtney Gum continued to prove that age is no barrier, playing a great game in the midfield and racking up 16 disposals. 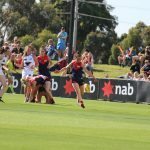 Daisy Pearce was instrumental in Melbourne’s thrilling win over Brisbane on Friday night, gathering 24 disposals and kicking two goals. 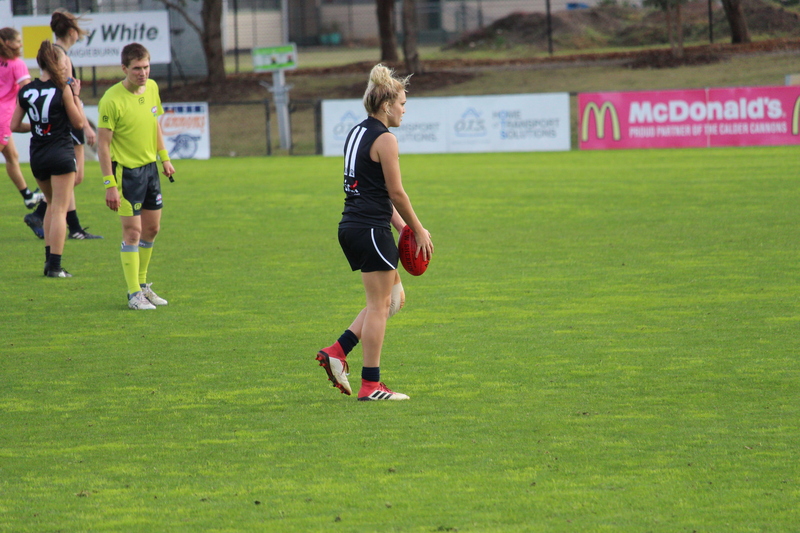 As always, she was complemented by fellow midfielders, Paxman and O’Dea, who each racked up more than 20 disposals. This elite Melbourne trio continues to make waves in the competition, and in our Team of the Week, with all three making their way into our best 21 yet again. On Saturday night, the Crows put on a brilliant performance against Carlton and won comfortably by 35 points. In the process, they earned the most representatives in this week’s best 21, with four players making it into the side. But their opponents did not fare as well, as the Blues only have one representative. They are joined by the Dockers in only having one player in the Team of the Week, after they lost to GWS at home. This round was dominated by the midfielders. Daisy Pearce, Courtney Gum and Ellie Blackburn all put on flawless displays, which assisted in getting their teams over the line. All three players polled a perfect 10 coaches’ votes. This assured that Pearce, Gum and Blackburn were automatic selections into this week’s best 21. Picking the rucks was a hard decision to make, with many players playing well in round five. 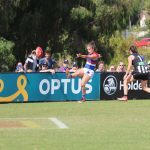 Coastal Titans recruit, Emma King was a standout in Collingwood’s loss to the Western Bulldogs on Sunday, and got the nod in our Team in the Week. However, GWS’s Erin McKinnon almost nabbed the ruck position from King, after equalling the highest number of hit-outs in an AFLW match (39). Carlton’s Breann Moody was also a sneaky chance, after racking 29 disposals and 11 hit-outs against the Crows, earning her a round five Rising Star nomination.